Ink and toner cartridges not in use need to be stored in airtight containers, standing upright in a cool location. If you are planning on not using a printer for an extended period of time you can remove the ink and toner cartridges and store them in airtight containers, facing upright in a cool location to save the ink from drying up until you are ready to use the printer again. Do not let your ink cartridges run completely out, replace the cartridges when your printer prompts you to. As the ink level lowers, so does the print quality. Cartages with lower levels of ink tend to print with streaks, lower visibility and poor quality all around. For multifunctioning printers experiencing dots or smudges on prints or copies, make sure to check the slit glass and copy glass. Cleaning the glass can solve common printing quality problems in seconds. Cleaning rollers regularly also helps prevent smudges. Always use a clean lint free cloth when cleaning rollers. 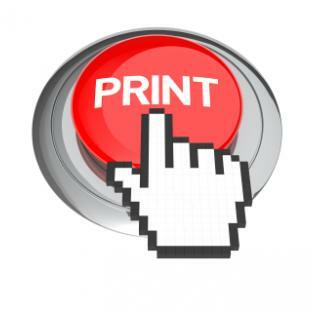 These tips can help improve printing quality and reduce stress with last minute print jobs. Always call a professional if you are still experiencing printing issues. Printers can be dangerous; trying to repair your printer yourself can cause accidents, damage the equipment, or worse yet electrocute yourself or a coworker. Contact us today to learn more about printer maintenance.